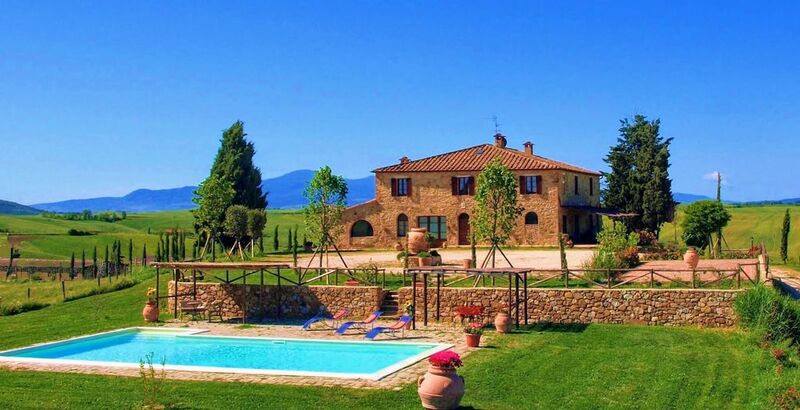 Belle villa en Toscane! piscine privée - wi-fi! Il Poggio is more beautiful than it looks in the pictures. Our host, Luigi, did a wonderful job of taking pictures describing his property. However, like all of Tuscany, it can't really be captured in a few photographs. This is an extraordinary property and our host, Luigi, couldn't have been more helpful. From the very beginning, Luigi was very responsive and answered all our questions. We visited Il Poggio in September 2018 and the highs were 86 degrees and above during the day. Il Poggio has 2 foot thick walls and remains cool during the day and comfortable in the evening. We had 7 people in all. The property is large and the views could not have been better. Also, nearby Montisi has some of the best restaurants we have ever experienced. Cheers to Luigi and Il Poggio! Amazing villa with 360 view! We had an amazing stay at Villa Il Poggio, the villa is fantastic with the panoramic view, the wonderful pool and lovely interior. We were 11 friends and stayed for a week and the villa had everything we could ask for. Luigi is a fantastic host, I would definitely recommend this place and me and my friends will for sure return! Excellent - nothing less than 5 star! Property was a little larger than we expected and provided lots of room for our party. The villa was easy to find and had views even better than we dared hope - quite stunning at all times of the day and in all directions. Amenities at the property were generally very good and only occasionally did we feel short of anything. The pool was wonderful and seemed to be cleaned early each day. We loved visiting the nearby hill towns - sometimes retracing trips of several years earlier and sometimes discovering new ones. The property was also convenient enough to easily visit Sienna and Florence - both of which draw us back on every Tuscan holiday. Montisi is a sweet little village and we used the local shop on several occasions - the ladies there were very helpful and welcoming. We went to the substantial and excellent Famila supermarket in Sinalunga for 'bigger' shops. Luigi was very welcoming on the first day but we had no recourse to bother him thereafter. Overall the best villa of our many family visits to Italy. We aim to go back soon. Lovely New Years Eve holidays! We spent 5 wonderful days at Il Poggio for our New Years Eve holidays. We were 10 adults and 9 children (age from 0 to 9 years old). The Villa has been better than our expectations: well furnished, breath taking view, wonderful garden, very clean, lots of space for us and the children, well equipped (we asked for the bed and bath linen included). The owner, Luigi helped us spending our time in the best way suggesting a chef that prepared two great dinners for all of us and that we enjoyed in our place with the kids free to play.Unfortunately we did not enjoy the pool as it was winter but we enjoyed the warmth and the atmosphere of the fire place. Best New Years Eve holidays ever. We cannot wait to be back at Il Poggio in summer!!! (Texte traduit automatiquement) En quelques minutes, vous pouvez rejoindre le Parc Artistique Naturel et Culturel du Val d'Orcia et Pienza, Montepulciano e Montalcino avec son. A proximité sont les eaux thermales de Bagno Vignoni, Bagni S. Philip et Rapolano Terme. Il ya beaucoup de nourriture et des visites de vignobles. Enfin, la ville de Sienne, Pérouse et Arezzo sont à moins d'une heure de la ferme. the pool is open from the first week of May until October 1st Part of the house is accessible for people with handicap, before booking contact the owner to inform him about the size of the wheelchair and other special needs. The cost of heating is not included. Its cost is 4,5 euro per cubic meter.